Perhaps most notable is the sheer amount of sleep people seem to be getting: apparently, a healthy 8.5 hours a night. Not bad! And though 99.9 percent of all respondents reported that they slept at some point in the previous 24 hours, the time reported for other activities is averaged across everyone in the survey, whether they did or did not report them in their time-use “diary”. This is where we need to pay attention to what we mean by “average”. For example, take a look at “working and work-related activities”. While it may appear that the average American works devotes less time to work than to leisure and sports on any given weekday, it’s important to keep in mind that the reported work hours are averaged out across all respondents– including students, the unemployed, and retirees. 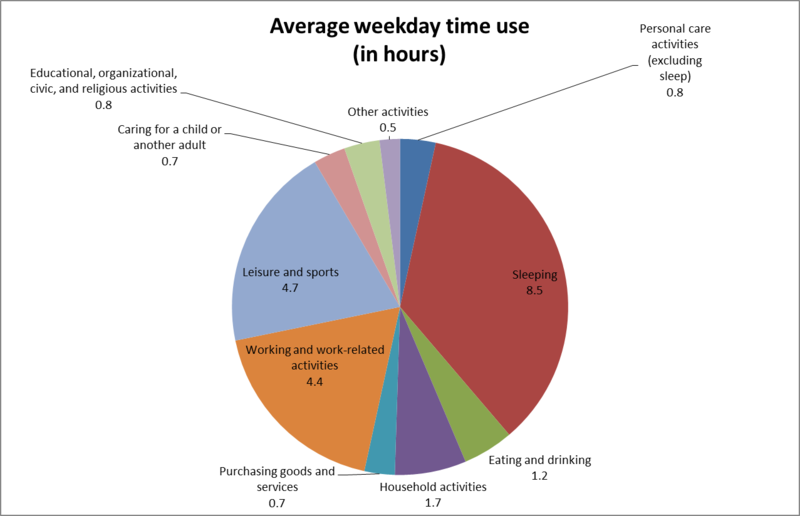 Among those who did report any weekday “work or work-related activities” (slightly over half of all respondents) the average amount of time spent was 8.5 hours. And among those who worked full time, the average workday was over 9 hours long. While 6.4 percent of respondents participated in religious/spiritual activities on weekdays, 15.5 percent of respondents did so on weekends. Nearly 80 percent of all respondents reported watching TV on an average day, weekday or weekend. Among married or cohabiting respondents living with children under the age of 18, over one third report that both partners work full-time. In this situation*, women report, on average, 5 hours 12 minutes weekday care for household kids; men report about 3 hours 24 minutes. This is a rich and reveling set of data, so I anticipate coming back to it for some Virginia-specific information. For those of you who can’t wait to check out some state-level trends, here is another pass Wonkblog took at the numbers: a set of maps showing state-to-state comparisons for ten different activities. How does Virginia stack up in that analysis? Well, for most of the measures, we’re about…average. **Yes, the people working out on the weekend may be an entirely different crop than those working out on weekdays, but we’re not seeing the galloping hordes out there.